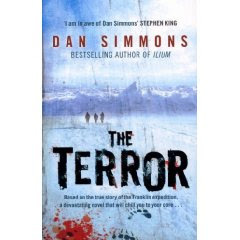 I picked The Terror up ages ago in Waterstones, but didn't get around to reading it until recently. It was billed as a horror story in the store, which isn't a genre I normally read, but the premise sounded quite interesting and I am a fan of author Dan Simmons' other books including Hyperion. The Terror is based on the true story of the ill-fasted Franklin expedition to the Arctic in search of the Northwest Passage. Two ships, the Erebus and the Terror, set sail to find the passage and their fates were never known. Graves and artefacts were found by other explorers but the story of the hundred plus men will never be fully known. Simmons cleverly uses this true story as the base for this fantastically thrilling novel. The dark nature of the human psyche is the true monster in this tale, not the huge beast that is methodically slaughtering crew members. The decline of the human body and the human mind is brilliantly explored and proves to be more chilling than the brutal attacks of the white beast. The story is well researched and it's all too easy to imagine yourself there in the dark and the cold, wrapped in clothes that never fully dry out. The invasion of the white Europeans into the lands of the native Inuit is also introduced in this book through the use of Inuit mythology. This is a large book and the pace is somewhat glacial, if you'll pardon the pun. However, it's well worth the read. Just wrap up warm as you read.